After exiting the Stanley Cup Playoffs in the first round this spring, the San Jose Sharks find themselves with the 19th selection in the 2017 NHL Entry Draft. The Sharks have some decent success drafting in the middle third of the opening round. 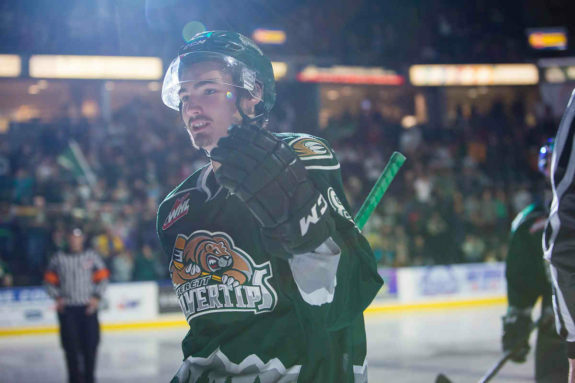 Mirco Mueller (18th – 2013), Tomas Hertl (17th – 2012), Ty Wishart (16th – 2006 ) are three good mid-first round selections to come under general manager Doug Wilson. There are a few players of note in the mid-round that could be available if Dealin’ Doug maintains the Sharks’ selection. There is little to no agreement on much of the 2017 draft class, especially once you get outside the top 10. These are personal draft rankings of players that I believe should be on the board when the Sharks head to the podium in Chicago. The Sharks are not an aggressive team at the draft. San Jose appears to place a good deal of value on hockey sense, character and defensive play and it would not be a stretch to suggest they overvalue these areas on occasion. 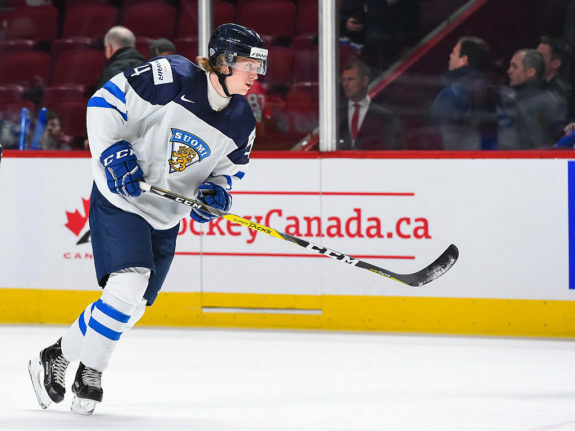 The San Jose archetype of player has few deviations, with Nikolay Goldobin (now a member of the Vancouver Canucks) and Rudolfs Balcers the notable, recent exceptions. Director of amateur scouting Tim Burke has a type of player he looks for — some can blossom, but the majority fit into safe, reliable players with a team-first mentality. That said, a swing for the fences approach in the 2017 NHL Entry Draft is needed. 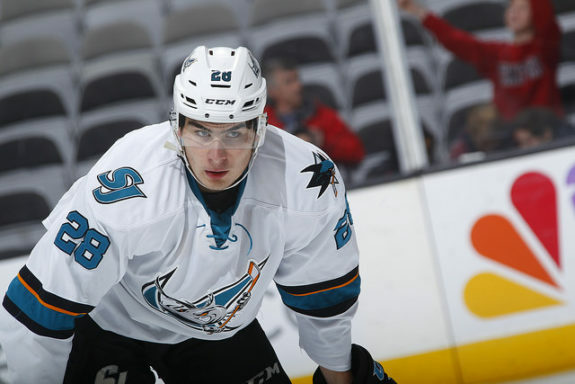 The Sharks are stocking up on middle-lineup players that might develop into top talent, but there is not a blue-chip offensive weapon in the prospect pool. Timo Meier might be the closest that comes to reaching that designation. There are a handful of potential impact players available to the organization. There are also a few later round selections that would make excellent choices as well, especially in a draft lacking consensus. Blazing offensive ability is not something you immediately think of with Sharks prospects. Burke might be a bit timid on a second boom or bust pick in the last three years, but Kailer Yamamoto is the player to swing for the fences with. He is only 5’8″ but plays fast, is a playmaker and oozes skill and creativity. The knock of his size will be hard to shake, but if he were 6’1″, Yamamoto would be in the top 10 with little to no debate. If the Sharks can steal one of the most skilled players in this draft with their pick and Yamamoto can transition to the professional game, the payoff could be huge. If Burke is swinging for the fences, Robin Salo is another name to remember. He scored more points in SM-Liiga action for a middling Vaasan Sport squad than Miro Heiskanen did with HIFK. Salo is not the fleetest of foot but with Marc-Edouard Vlasic turning 30 and only Paul Martin and Brenden Dillon as the other left-handed defenders available, some long-term planning on the port side of the blue line is in order. Salo is solid in the transition game, has decent size and an underutilized shot. Adding to the fun, he played a few games at forward for Sport this season, showing versatility should San Jose wish to move another defender to the wing. Okay, so it was more of an emergency to put Salo in the lineup as a forward, but it speaks to his hockey smarts to be a 17-year-old defender able to help his team. 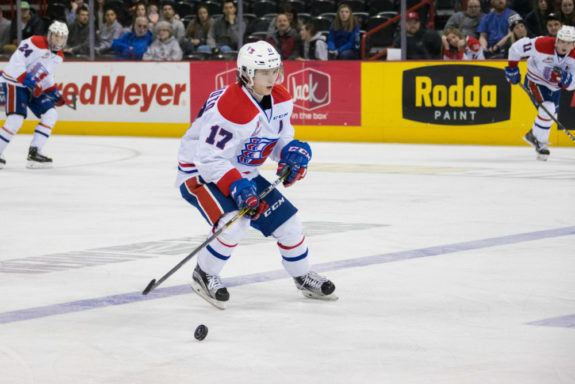 Some might say it’s too early for the 5’11″ centerman from the Spokane Chiefs, but your author has him ranked 15th, so it is a value pick for the Sharks. 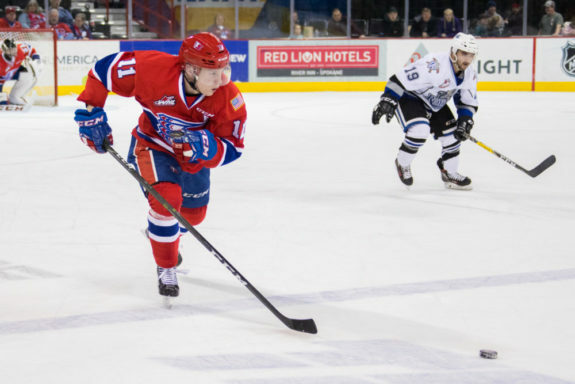 The speedy center plays an uptempo game that teams in the WHL struggled to contain, especially with his talented winger, and fellow target for the Sharks, Kailer Yamamoto. Anderson-Dolan has great on-ice vision and an improving defensive game and is a center, which is about 50 percent of the San Jose roster at nearly any level. Of all the boxes that the Sharks look for in a player, Anderson-Dolan might be the one that checks the majority of them. 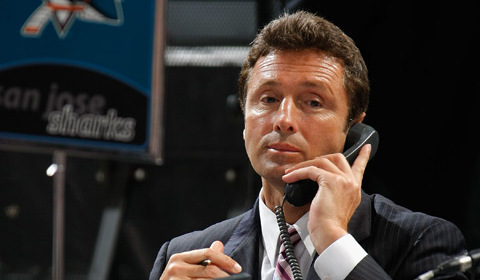 The Sharks traded away their second, third and fourth round picks in the 2017 draft. After their first round selection (assuming it is not traded away itself) the next pick comes in the middle of the fifth round. Then tack on two in the sixth and three in the seventh, and the 2017 draft class will be complete. San Jose has developed a reputation for pulling talent from the latter rounds: Justin Braun, Joe Pavelski, Kevin Labanc, Jason Demers, Tommy Wingels, Danny O’Regan and Nick Bonino are notable players over the last decade. Skill and talent are still to be had even in this draft class. Stepping into the void when first-rounder Michael Rasmussen went down with a shoulder injury, Olson is a spunky forward with an edge and not a lot of size. He’s a hard-nosed player willing to go to the dirty areas of the ice and shows a real creative streak as well. 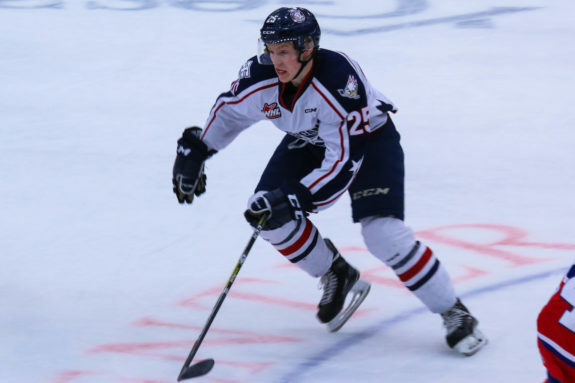 Olson appeared in all 72 games for the Americans and led the squad with a plus-25 rating. Another player that would be higher in the industry rankings if he was 6’2″ and 185 pounds instead of 5’10” and 150. The Sharks have next to zero organizational depth in net, and a potential NHL goalie should be on the radar — in the later stages of the 2017 draft, that could mean overager Griffen Outhouse. Outhouse has decent size, is athletic and battles to make the save and can steal a game. He is good down low, with quick pads but can over-commit at times. His regular season numbers took a step back this season as the undisputed starter but he found another gear in the playoffs. It was an adjustment for Studenic in his first season in North America, but he made strides all year long. The 6’ 166 pounder needs to add mass and, at times, tried to do too much with the puck. But, as often has he would ignore his linemates, he’d make a move that made you lean forward in your seat. Studenic is speedy and crafty with the puck and, in the late rounds, a player you take a bit of a gamble on to add offensive upside on the cheap. Former San Jose Sharks head coach Kevin Constantine helped shape young Bajkov and his mature defensive game shows it. Last year he went undrafted, which was a mistake. Bajkov enjoyed a breakout year with 29 goals and 49 assists. He’s a complete winger who plays both sides and is very smart and responsible with the puck. A teammate of San Jose draft pick Adam Parsells (who will re-enter the draft after not receiving an offer from San Jose), Ferraro is an offensive upside play on the blue line. His eight goals and 33 assists placed the rookie defender second in team scoring, appearing in 60 contests for the Bucs. Mario Ferraro (@bucshockey) on Team West ? He plays far bigger than the listed 5’11″ and 179 pounds. Ferraro has the traits of a modern, transitioning defender that could still be available in the back half of the draft. He’ll head to the University of Massachusetts-Amherst this fall and have plenty of time to develop in the college ranks. Readers might have caught a bit of a trend with the selections made above: All of these players are primed for upside that can propel them above their expected draft slot. The San Jose Sharks have the meat-and-potato players all throughout the system. What is lacking is the development and promotion of high-skill players to impact the scoresheet once the current core of offensive producers heads to the twilight of their careers. Goaltending issues, organizationally, are a concern. Wilson seems to have abandoned goaltender development with Antti Niemi and Martin Jones coming via trades after he inherited the best goalie in franchise history in Evgeny Nabokov when he took over the team in 2003. The plan, and it is a sound one, of finding goalies elsewhere and trading for them has worked for San Jose. But adding some bodies for the San Jose Barracuda to work with down the road would be smart.